Opening Hours Feb. 22, 2019 starting at 7 pm. Event Description The San Diego Guild of Puppetry invites old friends and new to the City Heights Performance Annex for an exciting evening filled with short puppet performances showcasing diverse puppet styles. There will be shadow, marionette, tabletop and giant puppet pieces, encompassing the traditional to the provocative and sure to delight audiences from ages 10 and up. An exhibit of notable puppets, performances and the puppeteers who created them over the last 25 years will also be featured. Performers will include: Animal Cracker Conspiracy, Mindy Donner, Drummers Without Borders, Kathy Felker Puppet Productions, and Twisted Heart Puppetworks. 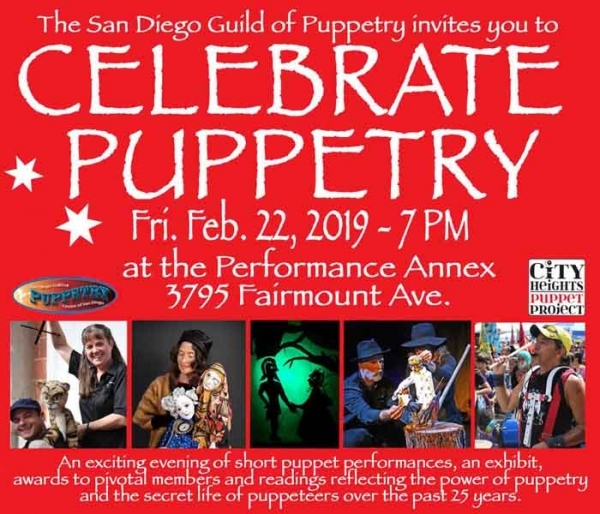 Special recognition will be given to long time Guild members who have been essential to the growth of the organization over its 25 years as a nonprofit and punctuated by live, puppet-centric, dramatic readings, reflecting the power of puppet theatre and the secret life of puppeteers.